A legendary, long-unavailable film has reached our shores from England, and it's as remarkable an achievement as one could hope for, considering its estimable reputation. 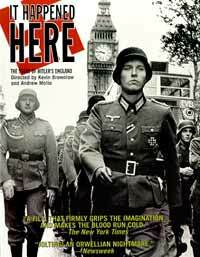 It Happened Here (1966), co-directed and written by military expert Andrew Mollo and film historian, Kevin Brownlow, is a dystopic fictionalized rewrite of World War II, wherein the Germans invade England, set up a Vichy-like provisional government, declare London a demilitarized zone, and fight stubborn partisans - supposedly all Jews and Bolsheviks - on the fringe. Mollo and Brownlow tell part of their story as a faux newsreel, with simulated documentary footage of London under Nazi occupation, and with all sorts of casual collaboration: local citizenry standing about, blokes shooting the breeze with, gals going on dates with, their Fascist invaders. The main narrative is of a thirtyish nurse, Pauline (Pauline Murray), whose man was killed by the Nazis. Declaring herself apolitical, she somehow comes to serve the enemy: "We've fought the war and lost it," she rationalizes. "The only way to get back to normal is to support law and order." Shot in persuasive black and white, It Happened Here is done with such careful, serious precision, that it does feel "real" when, for instance, helmeted Nazi soldiers pose for pictures by the Thames. Amazingly, Brownlow was 18 and "military expert" Mollo 16 when they began this 8-year project.